As part of my continuation of my last blog post about healthy eating, I’m going to keep going and post some more recipes, hopefully some that will help you put together your own healthy eating plan. Along with high quality, low-fat protein sources (one of my main focuses at every meal, as of now), you need some good veggies that are low carb and high in nutrients to help fill up the plate. While salad (without the heavy dressing, croutons and cheese) is always a good choice to get lots of veggies and volume to fill you up, especially during the winter, I want warm food, comfort food, not usually healthy food. Time to get creative and start roasting! 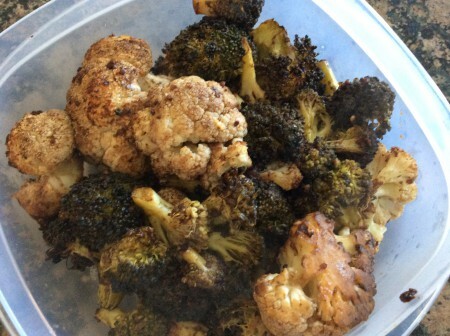 Lucky for me, I grew up eating broccoli with dinner almost every night (for a while it was one of the few green vegetables I would tolerate), and later on I learned of the joys of roasted cauliflower too (so much tastier than steamed). So when I was putting together my meals for this week, I decided to combine my cauliflower and broccoli florets and roast them up with some tangy balsamic vinegar, mustard and garlic. Voila! Veggies taken from boring and bland to flavorful and bold in no time. Let me know what other meats or veggies you’d recommend I experiment with next to keep eating healthy while not going crazy craving comfort foods. In a small bowl, mix together 2 tbsp. of balsamic vinegar, olive oil, mustard and garlic with a whisk or fork. Pour the cauliflower and broccoli florets into a medium mixing bowl, add the olive oil mixture and toss to coat everything evenly. Spread the florets a onto a rimmed baking sheet or glass baking dish lined with aluminum foil. Place in the oven for 45 minutes, stirring and adding the remaining tbsp. of balsamic vinegar halfway through the cooking process. Remove from oven and let rest 2 minutes to cool off sufficiently before serving. Sprinkle with salt and pepper to taste. My balsamic roasted broccoli and cauliflower is ready to go to work in its airtight container. This entry was posted in Paleo, Recipes, Side Dishes and tagged Balsamic, Broccoli, Broccoli and Cauliflower, Cauliflower, Gluten Free, Healthy, Low-fat, Paleo, Recipes, Roasted, Side Dishes on January 25, 2015 by Paige N.. I was with you just a few years ago, John. Roasted cauliflower changed the game for me. I can’t stand cauliflower, but I’m thinking this would taste good with just the broccoli, will have to try it. I’ll definitely have to check that recipe out. Thanks for sharing, Rebecca!